Any one have for sale or know where to get the FW16E expansion board? Pickings are slim and my machine is limited because of this. Thank you in advance. While I’m not familiar with this company, they claim to be able to access this board. Good luck, and you may want to check reverb.com periodically if unsuccessful with other links. I didn’t realize this was becoming difficult to obtain. This is not an endorsement - I know nothing about the seller. If you decide to purchase this, take the usual precautions. EDIT: It’s been sold (02/09/2019). I hope that means a Motifator member now has what they were looking for. Yea, I was looking for one of these a couple of weeks ago(nowhere to be found) also, but for the wrong reasons. I remember seeing the card in the docs when I initially purchased my Motif, at the time I couldn’t see why I might need 16 channels of audio out (I don’t do the computer daw thing). So for some reason I thought I would be able to use a FW16E to transfer 16 channels of audio to the DP 24 (silly me), it wasn’t until I realized I couldn’t find a FW16E anywhere, that I took the time to look up the details on the FW16E LOL. Ultimately I took the audio tracks over one at a time. Some using the wav files generated on the Motif, others using the midi playback and digital recording option. Took a little longer but.... I ended up with 16 tracks of audio on my DP 24 from 16 tracks of midi on my Motif. 3) Digital audio via an FW16E. By the way, if nothing else, the FW16E transfers data faster than via USB. For example, if using the XF Editor, syncing is quicker. Thanx man these are good threads, very good info in them. Good Stuff! This clears a lot of things up. I do enjoy the back n forth. We get the best info that way. 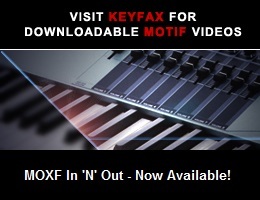 And you can add a 4th way to get audio out of the Motif XF. They referred to it in the two threads. Recording the Midi playback in the Motif to a digital audio file. that’s the method I had to use the other day. I had 16 midi tracks all mixed, sweetened, panned, eq’ed and FX’d up. I wanted to mix them with some stuff I had from two sax players and a vocal, and then do a wee bit of eq’ing ,compression, and normalization. I recorded each midi track to its own audio file on the usb drive. Yes it produced 16 separate wav (tracks/stems), and then I just imported each track into a separate track on my Tascam DP 24 where the Sax and vocal tracks awaited. Yea, I know its a little tedious (but it was easy). And sometimes the goal is not to get the audio into and out of a computer. In my case I use the Motif as my Midi Daw, and the Tascam as my Audio/Analog Daw. The Tascam DP 24 has some simple and basic mastering tools and I just needed to get 16 individual tracks of Motif sound to it. I realized it late, but the FW16E would have been of very little use in my case. There is a minority of us out here who do not use the general purpose computer as a DAW, and never will. But we still have the need to integrate midi,analog, digital audio. Sure computers are ultimately used in uploading/downloading, file conversion, Internet communications, CD burning, etc. But all the music production is done in devices dedicated to midi, analog, digital audio production. So if your Motif is your primary music production environment and you’re connecting up with other musicians and vocalists in something like a PortaStudio, you have a different set of challenges LOL. Yes. I should have mentioned that the three I was referring to are for real-time audio output. If anyone decides to purchase this, take the usual precautions. EDIT: It’s been sold (02/17/2019), for over the MSRP. It looks like they’re still in demand.